For too long, people have equated the South with the Confederacy. North Alabama is a distinct part of this state, one with its own history, that compliments, but never imitates, the histories of the Black Belt and the Gulf Coast. As a section of the Tennessee Valley it sits astride two of the vast regions that make up the American South– Appalachia and the lower section of the Mississippi River basin. Ours is a region that is both quintessentially southern yet decidedly non-Confederate. For too long people have equated the two. Madison county, and North Alabama’s, unique position emerged during two periods immediately preceding the Civil War: the 1860 Election and the 1861 Secession Convention. During the election, the counties of Madison, Marshall, and Lauderdale went for Stephen Douglas; Lincoln’s former rival in Illinois and candidate of the northern faction of the Democratic Party. Almost every other county in Alabama voted for Breckinridge. For the sake of comparison; Douglas carried one county in western Tennessee, six in eastern Georgia, and none in either Mississippi or Florida. The man garnered little of the southern vote. Once it became clear that Lincoln carried the electoral tide, southern states began hosting secession conventions. Prior to the election, the legislature issued a resolution declaring that should Lincoln win, Alabama would hold a convention to decide its future place within the nation. Unionists from North Alabama pleaded with the governor, Andrew Moore, to simply accept the results and remain in the Union. Yet he ignored these pleas, and in December 1860, voters chose their delegates. We all know that the majority of Alabama’s delegates chose secession, yet most from North Alabama voted against it. Opponents of secession were called cooperationists, and they were led by two men from Madison county: Jeremiah Clemens, a cousin of Mark Twain, and Nicholas Davis. Mid-convention Davis challenged a man to a duel for calling him a traitor to Alabama and Clemens, for the sake of political expediency, switched sides and voted for secession. On January 11, 1861, Alabama left the Union. Troops swarmed across the state, heading north towards the battlefields in Virginia. Some might point out that a regiment from Huntsville fought at First Manassas, or that men from North Alabama fought under Lee until his Surrender at Appomattox. These are both true, but ignoring the rest of the region’s Civil War experience is disingenuous. North Alabama provided rail links between the Mississippi River and the Atlantic Coast. The Tennessee River looped from its headwaters near Knoxville to its mouth at Paducah, Kentucky. Securing this region of the Tennessee Valley was integral to winning the war in the west. As such, Union gunboats landed at Florence in February 1862, seizing control of the river system. Huntsville served as the western control point for the Memphis & Charleston Railroad and its turn at occupation came next, in April 1862. North Alabama, previously shy about secession, soon settled in to occupation. In fact, the Union Army found the Tennessee Valley friendly enough to not only occupy it uneventfully, but to raise a cavalry regiment, the 1st Alabama, from the men of Memphis and Huntsville. Formed in October 1862, it was the only white Union regiment raised in Alabama during the war, and its men served admirably during Sherman’s March to the Sea. We are not Virginia nor Montgomery. There were no great clashes for North Alabama. We have no First White House of the Confederacy around here. Indeed, the most prominent figure from the Civil War to show up in North Alabama was General Sherman during a respite at what would become the University of North Alabama. Even Jeremiah Clemens, the only delegate from Madison county to vote for secession, spent the latter part of his life writing novels about heroic Union partisans battling it out with Confederate guerrillas in the mountains around Huntsville. Y’all, in North Alabama, we don’t have that much “Confederate heritage” to preserve. If we want to be honest about North Alabama’s role in the southern narrative, then let’s put up a statue of 19th century abolitionist and local politician James Gillespie Birney, or open a museum dedicated to former slave and founder of the Alabama Normal College (now Alabama A&M University,) William Hooper Councill. Trust me, the history of North Alabama is no Lost Cause. About the author: John O’Brien is an independent researcher for Huntsville African American History Project, and a graduate of University of Alabama-Huntsville in History, where his honors included a Dr. John Rison Jones Award for “If You Burn It, They Will Come: The Housing Authority and Huntsville, 1941-1960,” published in the Huntsville Historical Review. Although much remains to be determined in how the courts interpret the meaning of “alteration” and “disturbance,” those of us concerned about the role of such monuments in Alabama’s present and future face hard decisions about how to proceed. If nothing else, one thing should be clear: The vast majority of these monuments—those erected between roughly 1890 and 1930—were intended as the cultural side of the political revolution of white supremacy that swept Alabama and much of the rest of the South during those years. Immediately after the Civil War (1861-1865), black and some white southerners united within the Republican Party to build biracial democracy in the aftermath of slavery. They had some notable successes, including establishing some of the South’s first public school systems. But they collapsed for internal and external reasons. Like parties today, they had their share of infighting that created splits between party members. Far more damaging, however, were attacks from outside. In this case, these attacks came from whites who had reorganized the Democratic Party with its affiliated terrorist organizations, the most famous of which was the Ku Klux Klan. Although these Democrats succeeded in toppling postwar Republican governments, they didn’t succeed in completely driving black people from politics. Despite widespread violence, fraud, and intimidation, black men continued to vote in states like Alabama until well into the 1880s. By then, however, black people again presented a serious political threat through remnants of the Republican Party, working-class focused factions within the Democrats, and a new group, the Populists, who emphasized the interests of small white and black farmers and urban workers. To stop this new threat, as well as the problem of whites cheating other whites by open fraud, Democrats changed state laws to remove black men and many poor whites from the voting rolls. This process took different forms in different states. In Alabama, it was accomplished through the 1901 constitution. The new constitution made voting very difficult for poor and black men. Only a few years after the constitution was ratified, black registration had fallen below 3,000 in the entire state, and as many as 50,000 white men were disfranchised for failure to pay a poll tax. Statues and other monuments to Confederate veterans, like those erected in Huntsville in 1905, were the cultural side of this political revolution. Many white Alabamians had learned to distrust the men who had come to power since the war. These men had used fraud and violence—and sometimes even limited political concessions to black people—in the name of their own political power. By contrast, many younger white Alabamians revered the aging Confederate veterans as defenders of an old order to which they hoped to return. One example of this reverence was the proposal to include an exemption for veterans and their descendants in the constitution’s voting restrictions. Such an exemption not only placed veterans on a metaphorical pedestal (in anticipation of the stone ones), but it also allowed for large numbers of white men to evade tax payment and literacy requirements meant first and foremost to disfranchise black men. The statues reflected the hope that black disfranchisement and segregation would secure the old cause of white supremacy at the dawn of a new century. The statues and other monuments would stand guard, like burning crosses of stone, keeping safe the public square for white people for all time. As it turns out, this “New” South (a term developed by people at the time to distinguish their period from the “Old” South of slave agriculture) would last until only the 1960s, when a new generation of black and white southerners came together to tear it down. But, even as the political side of the New South collapsed, creating an even “newer” South, the cultural side remained. The statues and monuments were left over political propaganda from the early 1900s. But, to those of us who grew up in the South since that time, they looked and felt like they had been there forever. For many whites, they became neutral symbols of “heritage.” For black people, however, who remembered their true history, they were symbols of a long record of hate. But where does this leave us? As we know, in the wake of Jim Crow’s collapse, white supremacists fled the Democrats for the Republicans, and, over time, Alabama and other Southern states returned to de facto one party rule, even in the absence of poll taxes and literacy tests. One can only hope that the Memorial Preservation Act would be overturned in the event that progressive organizing shifts the tectonic plates of Alabama politics at some point in the future. In the short term, however, those of us who oppose the veneration of white supremacist propaganda as history can still take some concrete steps. First, we should work through our historical organizations and the Democratic Party to make sure that progressives have as much influence as possible on the Committee on Alabama Monument Protection. As long as Republicans dominate state government, they and their allies are likely to dominate the committee as well. But the act’s authors did reserve some seats for members of the minority party in the legislature and provided for important historical and cultural organizations to submit lists of names to the legislature and governor. We should take advantage of those opportunities to force Republicans to at least balance the committee’s membership or publically defend their choices. Next, we should make common cause with those people who opposed monument removal but favored adding signs and other additional information placing the monuments in question into context. Even if the courts narrowly interpret “alteration” and “disturbance” to restrict adding such signs, organizing around the issue can help bridge gaps over the issue that might allow for building larger political coalitions in the future. Finally, where appropriate, we should file waivers with the committee to further test the limits of the act. By using the act as an organizing opportunity, we can do much like what the Alabamians of one hundred years ago did in the face of the white supremacist revolution that created the 1901 constitution and erected monuments to reshape Alabamians’ understanding of the past—we can resist and continue the long, long struggle to make Alabama, a place we love, into a land of justice and fairness for all its people. About the Author: John McKerley is a native Huntsvillian with Alabama roots stretching back to the 1830s. His publications include Foot Soldiers for Democracy: The Men, Women, and Children of the Birmingham Civil Rights Movement. He is currently a historian at the University of Iowa, but he keeps involved in Alabama history and politics through the Huntsville African American History Project (HAAHP), an oral history project focused on collecting stories of race and resistance from the city’s recent past. A change of plans and a series of misunderstandings between U.S. Congressman Mo Brooks, Huntsville’s local Tea Party, and local constituents who signed up for tickets to a canceled town hall led to a minor kerfuffle last week that nevertheless yielded some interesting phone cam videos. We were fascinated to hear what Mo had to say about what Republicans in Washington are thinking. At the Huntsville Tea Party meeting at Whitesburg Baptist Church on Pulaski Pike on Feb. 9, audience members Ashley Ultim and Brent Caron both recorded portions of Mo’s comments, sharing them on Facebook or YouTube. Later, Deborah Barros-Smith arrived with friends and made her own video, also shared on YouTube with a boost from Daily Kos. These are all rough, hand-held phone recordings, and we are grateful to Ashley, Brent and Deborah for providing them. The clips maybe be hard to hear at times, but we think more constituents should hear what Mo Brooks thinks about Democrats, about the budget and about the dangers of serving in Congress. Therefore a small team of volunteers has transcribed these videos (thank you!) in order to share the words of Alabama Republican Congressman Mo Brooks with the broader public. Brooks speaks of the fears some Republican members of Congress are projecting onto Democratic constituents, and describes a strategy to starve certain programs of the funds needed to function. 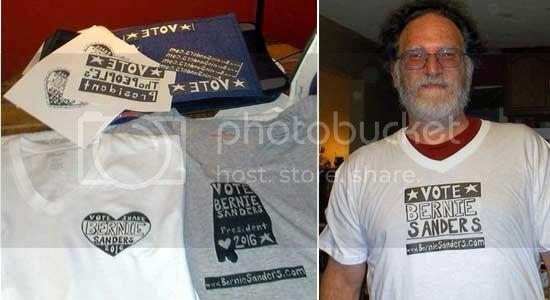 Vermont Senator Bernie Sanders recently announced that he'll run for President as a Democrat and raised $1.5 million in the first 24 hours, from 35,000 donors who gave an average of $43.54 each. The campaign also said that over 100,000 people had registered at the site. I wanted something with a homemade, folk art feel that every day people could use to make their own posters, shirts and tote bags. 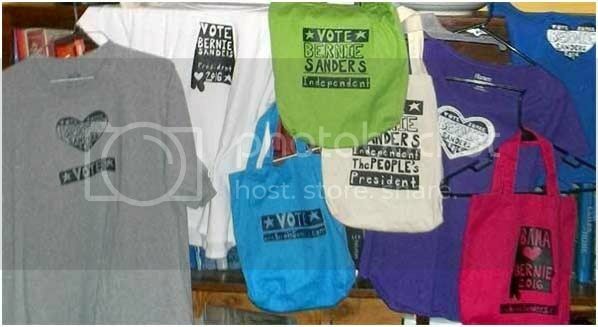 This way, people who don’t feel they have $25 to spend on a T-shirt can still participate in promoting Bernie Sanders as a candidate for President. These simple black and white images are easy to find and download. Since do-it-yourself transfer materials vary, it is important to read the directions before you start! Since you do it yourself, elements can be cut apart and arranged according to each person’s preference. These images are designed to be shrunken or enlarged within reason, downloaded, printed onto regular paper (for posters or handbills) or transfer paper (available at places with office, craft or sewing supplies,and online), cut apart, rearranged and ironed-on in customized designs. They include the web address to send donations to Bernie’s national campaign. See how versatile the mix-and-match elements can be? Friends from Left in Alabama came over Saturday night and we made several T shirts and tote bags. Let our efforts inspire you to make your own! Watch for new designs that are on the way. Go through your old clothes to see what you might refresh into wearable campaign art. 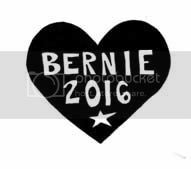 If you would like to make your own iron-on transfers, check out the Facebook page Free Original Clip Art for Bernie Sanders Supporters. You can buy t-shirt transfer material online. Most local craft/department stores have them too. 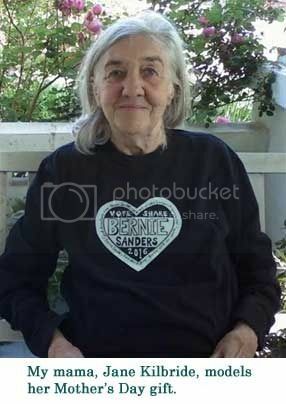 Jane DeNeefe of Huntsville, Alabama, an avid supporter of Bernie Sanders for President, is author of Rocket City Rock and Soul: Huntsville Musicians Remember the 1960s and an occasional contributor to Left in Alabama. Fordham professor Mark Naison, aka Notorious PhD, is proud to be badass, and he thinks our nation’s public school teachers are pretty badass too. Teachers are pushing back against the High Stakes Testing that stresses children, threatens educator jobs and closes schools. They love their students but resent the corporations and foundations that stand ready to privatize every aspect of public education, and they bear witness to the political decisions that siphon away the support students need to thrive. Yet teachers are maligned, and their knowledgeable voices are often squelched in public education discussions. Convinced that teachers (with academic freedom and adequate funding) have what it takes to solve the problems they face, Naison co-founded the Badass Teachers Association. The Facebook page launched in June 2013 swelled in three weeks to over 21,000 members , a broad-based, “multi-partisan” coalition of Badass Teachers, aka BATs. When over 21,000 teachers from fifty states start talking about the problems they face in their schools, some diversity of opinion is bound to emerge. Discussions and micro-discussions raged about everything from poverty to Citizens United, from Piaget’s stages of child development to the impact of the civil rights movement on schools, with lots of complaints about bad guys like Bill Gates, Eli Broad and Arne Duncan. 21,000 teachers can tie an awful lot of topics to public education. Out of BAT chaos, common themes revealed themselves. People made friends and created alliances with teachers in other states. Most teachers resent the pressure to “teach to the test.” Some are trying to figure out how to adapt their lessons to the new Common Core Standards, while others are completely opposed to Common Core. Very many see the Common Core Standards as a Trojan horse that will bring along “corporate reform.” Badass Teachers hate corporate reform, a package deal of High Stakes Testing (HST) , Value Added Modeling (VAM) that ties teacher pay or employment to test results, and scripted lesson plans (such as from Pearson Learning) that do not allow for teacher autonomy. They would rather have fair assessments designed by teachers, not standards driven by big business and the Chamber of Commerce, and tied to the punitive “accountability” framework. There are two main strands of opposition to Common Core. For science-based thinkers along the “blue state” end of the political spectrum, opposition has to do with concerns about privatization, academic standards ill-matched to children's developmental stages, and curtailed teacher autonomy. But from the libertarian or Christian fundamentalist “red” right, the critique could be summarized something like: “Common Core is Obama’s atheist communist plot to trick us into indoctrinating our children and stealing their data like Big Brother. As usual, our only salvation is in state’s rights and church schools.” So far in Alabama, that second strand provides the main thrust of resistance to Common Core. Rational teachers and parents who object to Common Core have been aligning with the former because, who wants to be identified with the latter? Well— Mark Naison and his colleagues, the founders of the Badass Teacher’s Association, that’s who. Naison advocates the concept of an “Occupy/Tea Party” coalition that includes Democrats, Republicans and Libertarians to take on the corporations and government entities that threaten education, and, at least as of this writing, July 13, 2013, he hasn’t let the idea drop. Under his leadership, the explanatory platitude being offered around BAT is the triangulating notion that “The enemy of my enemy is my friend.” It’s like having a high-stakes gambler navigating a potentially mutinous ship. No one really knows yet who-all will arrive where when. The main problem with this risky behavior is that the “Occupy/Tea Party” strategy has a different meaning in a red state than in a blue state, and some BATs say it wasn’t even all that successful in New York where the questionable idea was hatched. The Alabamians gathering under the broad-umbrella of reactionary Republican politics– the creationists, the racists disguised as states rightsers, the voucher people—have end-game values more aligned with the Republican corporate reformers (and their Democrat cronies) who want to privatize as much public school money as possible. The tea party does not share goals with the left. In a state like Alabama, with starved budgets, high stakes testing and “failing” public schools—corporate reform policies play right into rightwing Christian fundamentalist Tea Party hands (and if that is “name-calling,” so be it.) But, hey, they bolster the membership rolls of BAT! And numbers count to a high-stakes gambler. Progressive-thinking BATs, history-minded BATs, socially conscious BATs, people aware of the old Southern Strategy to turn southern racists into Republicans, and people who can recognize astroturfing when they see it , all started pushing back. The TP posts got worse. Then, as Mark Naison lounged on a cruise ship in the Caribbean this past week, trigger-happy BAT administrators started kicking out progressives. Occasionally there were reasons like “rudeness” or “divisiveness,” or in my own case, it was my supposed “hateful” religious “intolerance” that got me banned from the Alabama group. In the latest purge, some were accused of being Teach for America shills, but few expelled BATs received any explanation at all. Now, alternative and spin-off groups are springing up. After being booted from BAT for “attitude,” Richard Sugerman started a small group for more focused discussions without certain derailment, Progressive (Formerly Badass) Teachers Coalition. Another spin-off group, Blame Teachers First, is a place to get silly without being reprimanded, a refuge from the batshit craziness of administrators who, the first week, prided themselves on the edginess of calling themselves “Badass,” only to devolve by the third week into admonishing others to show “respect ” by not using “derogatory” shorthand like “baggers” or “TP.” These digressions and diversions over juvenile issues like name-calling at times appeared to be designed on purpose to prevent authentic dialectical discussion. The people who tried hardest to explain that the contradictions inherent in this awkward “coalition” were important matters of principle were hounded, alienated, or blocked unless they learned to keep their dissent to themselves. BAT has some relatively high-profile support, from authors like Kris Nielson who wrote Children of the Core, and Karen Jennings Lewis, leader of the Chicago Teacher’s Union. Perhaps the best known anti-corporate style reformer to shout out has been Diane Ravitch, who wrote in her blog , “I was uneasy with the name, but I got over it. “ Since Ravitch understands that “We live in a time when entrepreneurs are eyeing the schools and their budgets as a source of profit, a chance to monetize the children, an emerging market,” it will be interesting to see what she thinks of the squelching of independent, progressive voices in BAT who understand this problem, in exchange for keeping the Tea Party crowd. Tim Wise is the latest ally on BAT’s potential enemy list because he is doing anti-racism training with the “scabs” of Teach for America. He explains his position here. Yet the Tea Party is a welcome part of the coalition because they hate Common Core with a passion. Kris Nielson is scheduled to speak against Common Core at Alabama Protestant churches in August. Will Ravitch continue her support of the Badass Teacher’s Association? Will BAT manage to keep the Teachers but get rid of the Bad and the Asses? Or will the entire colony get wiped out by brown nose disease? Regardless of what happens, Alabama parents of all persuasions can give their children a break by opting out of testing. Jane DeNeefe is the author of Rocket City Rock and Soul: Huntsville Musicians Remember the 1960s, and coauthor of Alabama’s Civil Rights Trail: An Illustrated Guide to the Cradle of Freedom. She tutors reading and writing at Space City Learning Lab in Huntsville, Alabama.